We went to the zoo today-in the past year or so, they've been renovating their waters building (which housed all the watery animals like fish, penguins, etc) and renamed it the Oceans. Today they were having a special preview for zoo members only so we went. We figured it would be a lot more crowded when it was open to the public. They really did improve it as well as adding some neat stuff. They have these cute (??) little hammerhead sharks. I'm not sure if they're babies or just small but they were probably no more than 2 feet long. More like 18 inches. Plus they have a petting pool with dogfish sharks. They added jellyfish, plus some touchable creatures like urchins and starfish (and snails, hermit crabs...that might have been all). They kept some of the old stuff but put it in better tanks. They added a bunch of eels-they had one and now they have too many to count. They're ugly (no pics-I took some but didn't post them). They made the floor between the penguin enclosures clear so that you can see the penguins swimming from one side to the other. Here are some pictures. If you can't tell, my favorite part of the zoo is the marine part and when it wasn't open (when they were renovating) I didn't even want to go to the zoo. I do have some pictures of land dwelling animals too. Camera info: Most of the Oceans pictures were taken with my 50mm F1.8 lens with an ISO of 1600 and aperture of 1.8. I thought they came out pretty nice for such a high ISO and short focus depth. The first picture (the hammerhead) was taken with my 28-105 and flash. That was before I switched lenses. The outdoor pics were taken with my 28-105 lens on ISO 200 on the TV setting at 1/200 second. I used Auto White Balance for all of them. I always forget to change that for the different conditions so I find that leaving it on Auto works best for me. This is a picture of the hammerhead sharks. There were a lot of them in the tank and the swam pretty quickly so I was lucky to get a decent shot. 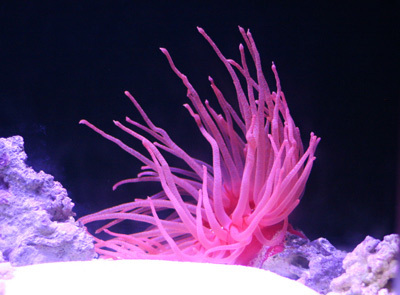 This one is a pretty pink anemone. They are so neat to watch. 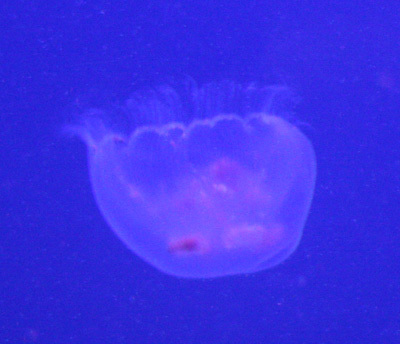 This is a jellyfish. According to my kids, they have no brain (the jellyfish, that is). 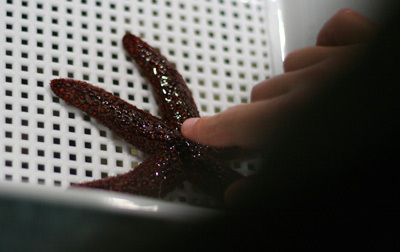 This is a starfish that they were letting kids touch (gently). That is Jake's hand touching it. They also touched a sea urchin but I didn't get a picture of that. 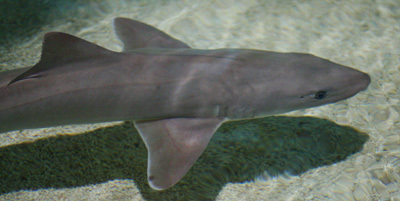 This is the dogfish shark-one of the ones the kids were able to pet. It took a while to get them to come close enough, and it was really crowded. I didn't get any pictures of the kids actually petting one because I had to be watching so that I could yell "here it comes-pet it!". Notice how big the eye is. They looked like human eyes. This is a baby giraffe that was born about a month ago. It was hard to get a picture of it because it stayed over by that fence. 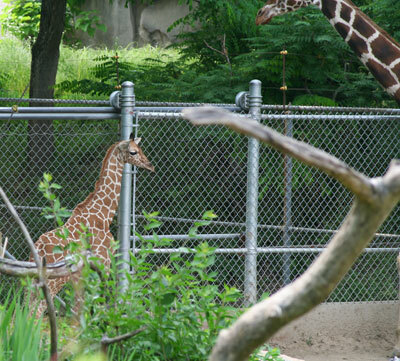 I think they just recently put the mom and baby in with the bigger giraffes and it was probably wanting back into the nice little safe pen. You can sort of see the size of the baby by looking at the part of the mom giraffe in the corner of the picture. At least I think that was the mom-it was staying with the baby the entire time. 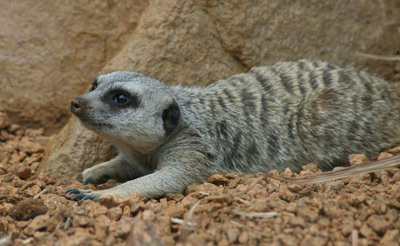 This is a meerkat. They look like big rodents so we (Steve and I-the kids don't know this) call them meer-rats. There was another amazing thing about this trip to the zoo. Jake didn't have a meltdown. It was so amazing that I wasn't quite sure if someone had swapped my kid. And we didn't even go into the gift shop which makes it doubly amazing. Jenny did look mad all the way home, so I have a feeling that was all about not going into the gift shop (which she was warned about before we went). ...in the crafts department. I'm working on my curtains, but there's really nothing to show or report. Only that I'm bored to death with them. I wonder if the assembly line method is really a good idea. I seem to get really bored sewing the same seam dozens of times and pressing the same shape pieces over and over. I'm pluggin' away at them though, because this summer I really need to have some curtains up in my craft room. Even though I'm doing nothing, I did buy some stamps. Yes, even though I do nothing, I still buy. I bought some of the clear doodlebug stamps at my friend's webstore, A Walk Down Memory Lane. I ordered them on the 21st and they arrived today, the 23rd (yes I know it's actually the 24th-it's late). That is probably the fastest service ever (and I'm pretty sure it's not just because we're friends). Anyway I recommend checking out her store-she has a ton of neat new stuff. She also sells the Bind-it-All that I posted about before. note: all herbs/spices are dried. If you use fresh, I think it's 3 times the amount. I don't use fresh-I'm not that good of a cook. Brown beef w/ onion. Drain well. Add everything else except the bay leaves. Stir well. Add bay leaves and stir gently. If you break a bay leaf, it might be a pain to find all the pieces, so I add them last and stir gently. I haven't broken any yet so I can't say for sure if it's a pain. But it's a pain just to find the whole ones so I'm assuming it's a bigger pain to find pieces of them. Anyway, once it's all combined, bring it to a boil and then reduce the heat to a simmer. Let it simmer until the noodles are done cooking. I cover it because otherwise, it pops little spots of sauce all over the place. Serve the sauce over spaghetti noodles. We use Hodgson Mills whole wheat spaghetti. I love whole wheat pasta-it's yummy. If you want to, sprinkle on some parmesan cheese. We just started using the Kraft kind that you grate yourself. It's in a neat grater type container. I think it's probably not as good as the real parmesan cheese in the blocks but we haven't found one locally that is considered safe for Jenny's nut allergies (who would think parmesan cheese could have nut traces in it. Anyway that's what the companies have told me-that we should avoid it). I finally got all of the pieces cut out for my curtains. Yowza that was a lot of pieces! I think it was the most boring part too-I had to cut a total of over 400 pieces out. Then I had to cut a bunch of those in half diagonally. I used my paper cutter (Carl cutter) which made it SO easy. Most of the pieces were from the white and frankly, I was pretty sick of the white by the time I was about halfway through. I don't know how people can make a quilt in a weekend-I guess they have more ambition than I do. I think if I could actually work on it every day, and for more than a couple of hours at a time, I could do it faster. Here are all the pieces, not counting the flying geese units I posted a picture of a few days ago. So now the sewing begins. I have all of the flying geese units already sewed. Just need to do the inside pinwheels, then put the whole thing together. 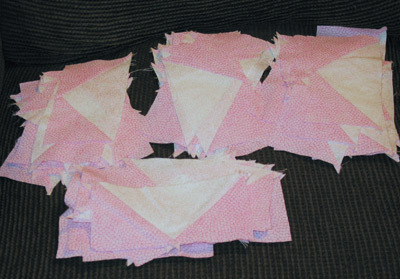 Then stitch the sashings and cornerstones to the blocks and get a sheet for the backing and put that on. So then while I was in the shower today I decided it would be neat to make a shower curtain out of blocks. For those I'll use plain blocks-I saw the idea in the newest issue of Quilts & More. I love my cute froggy shower curtain from Target but it has already busted through two of the holes and rather than fix those, I'll just make one. I guess I'll have to back it with a sheet like the curtains and then get a shower curtain liner to put on the inside so that the liner goes in the tub and the actual curtain stays on the outside. I sort of broke my vow not to buy more fabric until I got these two projects finished. My ironing board cover is ripped so I need to replace it. But my ironing board is not a normal one-it's an antique one I bought at a yard sale. Not a standard size. Currently it has a cut up mattress pad for padding and some UGLY orange fabric that I had so much of I didn't know what else to do with it (someone gave it to me). I decided to go all out and got some insul-brite (some padding stuff for ironing boards, hot pads, etc) and some cute bright fabric for the cover. Another problem with my ironing board is that I used it to iron my kids' perler bead creations. The way I do that is to put the paper on top, iron, immediately flip it over with the paper still on it (now on the bottom), put another paper on top, and iron again. I guess that's a bad idea-the paper got used so much (my kids really really love making perler bead creations) that it got sort of burned. Well not really burned but nicely browned. And apparently when I flipped it over it transferred that nicely browned stuff to my ironing board. Not a problem until I was ironing blocks and sprayed water and the brown stuff transferred to my blocks. Thankfully it came right out with a quick wash in cold water and woolite but it was scary. I put an old pillowcase on it for now but every time I shift my fabric, it shifts the pillowcase too. So there are two good reasons I needed a new ironing board cover (and padding-might as well do it right this time). I've been sick with a cold so I've been doing a whole lot of nothing. I did want to share this website though, for using Glad Press & Seal for quilting. Another way to do it instead of the method shown on that site is to draw the lines on the press & seal and quilt right over that, and then tear off the plastic. Since I don't have a chalk pouncer I might try that method first, but I like the idea of not having to pick out all those pieces of press & seal. Update on the Stampin' Up wheels. They are now available again. After throwing everyone into a panic and telling us all that the sold out wheels are gone forever, they've decided to change their minds and now they'll *supposedly* be available until June 30th. The retired accessories list comes out in June 20th so I guess I'll wait until then to order the last minute stuff I "need". I did get some sets in the mail today so I'll try to make something with them and post it. I'm just not in the mood lately. Plus it's so hot in this house. Maybe I'll drag a big fan into my craft room. I'm just imagining all my craft junk blowing all over the place. eek. Here's a picture of the fabrics I've bought just in the PAST COUPLE OF WEEKS. Yes I have a problem. The good news is that most of it (all but the bottom two) were bought on sale for really cheap at Joann's or Alco. The bottom two were bought to go with some that I bought a while back at a quilt shop and neither one was cheap. Those two are the only ones I have real plans for. 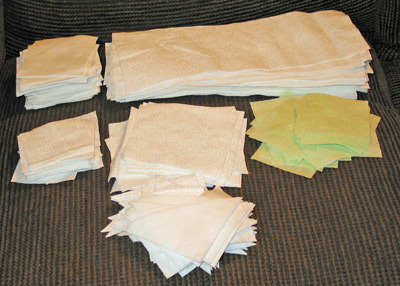 I had no idea how much I'd bought until I had it all washed and was folding it all up and putting it in a pile. 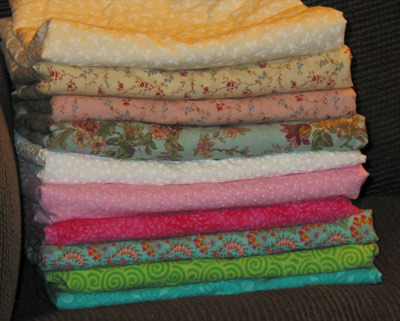 Granted, my stash is nothing compared to a lot of other quilters (not that I even call myself a quilter-yet) but I haven't even been buying for very long yet. So I vow not to buy any more until I finish my curtains and one other big (lap size) project. Probably not the one with the expensive fabric because I have been discovering that I don't even have any business buying expensive fabric yet-not until I get a LOT more practice. So speaking of my curtains, here are the flying geese units I had to make for it. I had to make 96 of them but it didn't take that long because I used the fast flying geese method on this website. Note that there is a typo there. Where it says that 1 large and 4 small squares will make 2 flying geese units it should say that they make 4 units. I'm not completely sure I like this method better than the one where you put the squares on the ends of the one rectangle, stitch the diagonal, and then trim off the excess, but I do think it's quicker. I didn't get a chance to work on my curtains at all and didn't get any pictures yet. So I'll just post the cookie recipe. These are pretty classic and I think just about everyone already has this recipe but just in case, I'm posting it. note: we have nut allergies in our family so we don't use the peanut butter. Instead, I substitute soy butter or sunbutter should also work. Also, this recipe makes a ton of cookies. I think it's actually doubled. Line several cookie sheets with waxed paper. We usually end up using 3 cookie sheets with the cookies pretty close together. Melt butter in a heavy saucepan. Add sugar and milk. Stir well. Add cocoa powder. I sift it through a strainer so that it has no lumps. Stirring constantly, bring to a full rolling boil over medium heat. Allow to boil for ONE MINUTE. Remove from heat. Add vanilla and peanut butter. Stir until peanut butter is completely melted. Add oats and stir well. Drop by tablespoons onto waxed paper lined cookie sheets. I have the three different size cookie scoops that I *believe* pampered chef sells and I use the smallest one. Allow to set up-it takes a while depending on the room temperature and humidity. I always think they'll never set up but they always do. The Stampin' Up retired list is out. You can see it by going here and downloading it. The wheels are going fast! They're made by a 3rd party so when they're gone, they're gone. I had to go order a couple this afternoon. Funny, I didn't really want any wheels until I found out they might be going out of stock. Typical. While I was at it I ordered 2 sets that were also going to be retiring. I need to get some stamping done-I haven't done any for way too long. I have been working on my quilted curtains though. I'll post about that tonight when I get some pictures of my progress so far. Cut the vanilla beans into 1" pieces and split each piece (or you could split each bean and then cut into 1" pieces). Pour a couple of inches of the vodka out to make room for shaking. I just pour out an inch or two from the neck of the bottle, which isn't much at all. Probably not even enough to get a buzz. hehe. Anyway. Put all of the vanilla bean pieces in the bottle. Put on the lid and shake. Shake the bottle at least a couple times a day every day for 2 weeks. You can keep shaking it past the 2 weeks if you want-it won't hurt it. If you don't like the beans or seeds in it, you can strain it through a coffee filter, but the beans and seeds keep releasing flavor to make it even better. So we leave it all in until the bottle is nearly gone. I put a label on the bottle so I can keep track of when I started it. I just started a new bottle-this one has been going for 4 days and you can see how it's already brown and vanilla-looking. When I use it, I sometimes put 1-1/2 or 2 times as much as the recipe calls for, just because we like a lot of vanilla flavor. In a few days I'll have to make No-bake cookies for Sammy's birthday. I'll post that recipe tonight-it uses vanilla.